Commonly we suggest the hobbyists and newbies to use ready to use jumper wires or build custom size jumper wires with crimp pins. Ready to use jumper wires are great but has limitations at higher end. Here are practical tips on using breadboard wire and wire stripper. Good quality jumper wires with machined pins are actually good only for breadboard. You can not use them on any kind of prototyping boards. Additionally for too much complex circuits, wires save space and the work looks neat and clean. In electronics you will certainly need some wire to complete your projects where soldering become a need. As we work with low voltage DC circuits, we simply just a few spools of solid core wire of 22 Gauge. Basically I feel 22 Gauge comfortable to push the ends in breadboard. Some uses 24 Gauge wire which tightly fits. That 22 Gauge solid core wire is kind of standard breadboard. Previously we talked about various types of wires and separately twisted pair cables. In our case solid core and stranded core wire are coming in to question. Why we commonly use solid core wire? Solid core wire is rigid and will retain the shape we will give them which is great for creating circuits for IC, LCD display like components with wires at each holes. Stranded core wires are flexible and not retain the shape. Also, solid core wires are cheaper to produce, cheap. 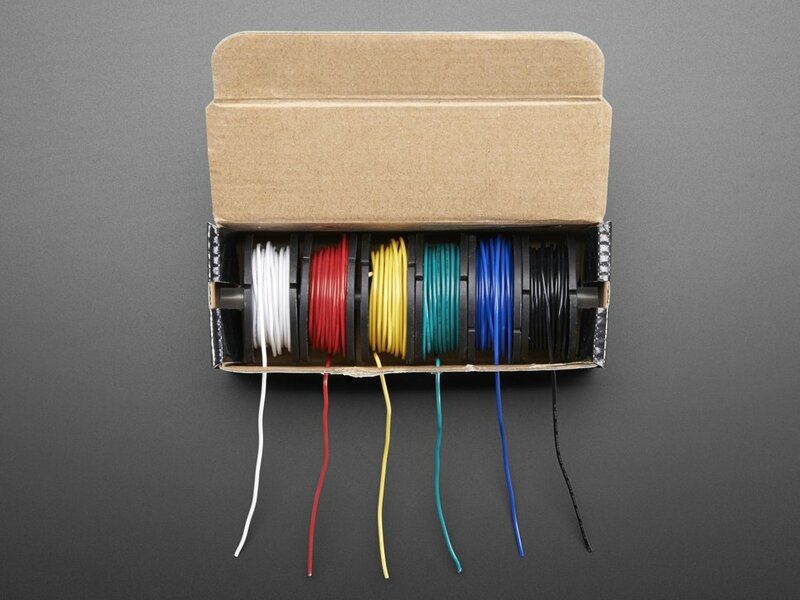 There are set of spools of solid core wires of various colours. They cost huge. They are sometimes called hook-up wire kit. As long we are not opening an electrical repair shop, rainbow color is actually not of huge need. Coloring a white color solid core wire should work fine for limited length. Stranded wires are very flexible and can withstands a greater amount of flexing. In AC circuits there is skin effect where at higher frequency the current travels mainly on the surface. So for our low voltage DC, 22G solid core wires usually great except when we need to connect a component outside like a sensor which we will move frequently. To connect a component outside like a sensor it is better to use stranded wires. Stranded cables has tiny columns of air surrounding the strands, they oxidize faster and looks darker. When we cut the wires, if we cut at an angle, that becomes easy to insert inside the breadboard holes. If some hole appears small, we can run the wire end on fine sandpaper. If we want kind of needle like tapering end, then twisting the end inside fold of sandpaper works fine. To save time and wire, we can keep some sizes of wires cut and stripped beforehand. One of them is connecting (+) and (-) rails of on breadboard. To use stranded wires for breadboard, it is practical to twist the end and touch with soldering iron to make the cut end stiff. Tin versus pure copper versus tin coated is a big story of various academic opinions. It is obvious that copper is always the best. Usually silver, gold etc not used as 22G wires. One feet 22G 24K gold wire costs around $125. Gold, silver wires used for jewellery beading, artistic creation purposes. Regarding wire stripper, possibly a good cramming tool we talked about in the guide for creating custom size jumper wires with crimp pins would work as multipurpose tool. It is not exactly easy work to select a cutting and stripping tool. Hand tools are costly. Actually using an old style shaving blade or sharp paper knife does the job of stripping but that is risky to cut own fingers. Rest we talked in Breadboard Wiring Rules & Useful Hacks, wire wrapping etc articles on this website. Also it is not bad to look at tikka kebab circuit design to get creative ideas on circuits. This Article Has Been Shared 3056 Times! Convert Computer Power Supply To Breadboard Power Supply. We Started From How To Start An ATX Or SFX PSU And Ended At Lab Bench Power Supply. Cite this article as: Abhishek Ghosh, "Tips On Using Breadboard Wire and Wire Stripper," in The Customize Windows, November 23, 2017, April 21, 2019, https://thecustomizewindows.com/2017/11/tips-on-using-breadboard-wire-and-wire-stripper/.